I am not to keen on doing Mens cards...prefer Glitter... Flowers..Ribbons...and Bling.. I love the layout and colours on this superb card. The image is beautifully donr. A wonderful creation. I do the plainest mens cards imaginable... but am always tempted to put a ribbon or flower on them!!! LOL. Great man card Sylvie, cute image. Thanks for playing along at PFP. 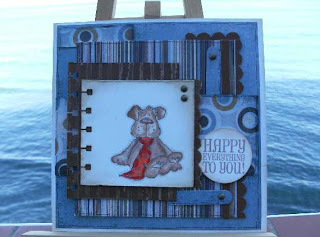 fantastic card sylvie.i love the fab image and your papers and layous are great. I love the image and i really like the way you have made this card. Really a nice card for a mail.